Let me start by saying, "I am SO fortunate - on SO many levels!" My father was born in a small town in Mississippi. His ancestors arrived in America from England and Scotland some time in the 1600s. He was drafted and fought overseas in WWII. That experience likely gave him the desire, after he returned home, to see more of the world. He became a geophysicist and his work took him to Alberta, Canada, where he met and fell in love with my mother. Her father and mother were born in Moscow and Kiev, repectively. They were Germans living in Russia, and in 1928 were lucky to be approved to emigrate to Canada. At the train station in their village, everyone boarding the train to emigrate was required to pass a physical before being allowed to board the train. My grandmother was sick - we suspect it was something akin to the flu. She, as well as my aunt, who was a 2-year old baby, was denied boarding. So, my grandfather got on the train alone, and went to a window seat next to the platform. The train platform was crowded with people trying to get on the train and being pushed and pulled off. In the rush of people toward the train as it departed, my grandmother lifted the baby through the window to my grandfather who reached out and grabbed her. With one arm around my aunt, my grandfather pulled my grandmother to him with the other. She clung to the train's window frame and he held on to her and pulled her into the train as it pulled away from the station. Of the others clinging to the train, some dropped off and some were pulled into cars. They made their way to a ship that took them to Southampton, UK, where they spent weeks in a detainment center before boarding the ship, Empress of Australia, for Quebec, Canada. Although between them they spoke 7 languages, from German and Russian to Slavic dialects, neither spoke English. But, he found work as a carpenter for the railroad and she was a cook. They made their way across Canada to Saskatchewan, where my mother was born - delivered at home with my grandfather acting as midwife. Eventually, they moved to Alberta, where their third, and final child, another girl, was born. They worked hard and instilled in their three daughters a strong work ethic and the importance of education. My mother became a professional figure skater and performed in ice shows throughout Alberta and Saskatchewan, even after marrying my father! In fact, she taught figure skating until she was 78 years old! My father's job took our family around the world; we lived in Madagascar, Chile, Brazil, Bolivia, Canada and all over the USA. Everywhere we lived my parents encouraged my sister and me to learn as much as possible about the local people and their culture. It was an unparalleled educational experience for which I am so grateful. My sister, my only sibling was born in Alberta, Canada. I was born in Mississippi. On my father's side, I come from generations of native-born Americans. But, on my mother's side, I'm the first-born generation American! 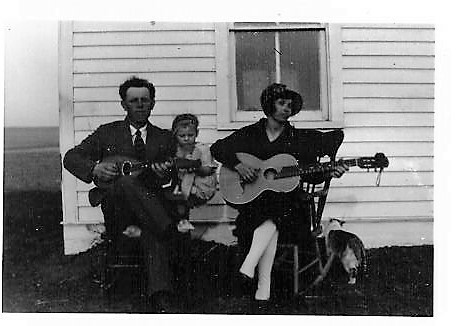 As a final note to this story, my maternal grandparents were both musicians - she played the 7-string guitar, and he played the mandolin. This is a picture of them playing together on the plains of Saskatchewan with my mother sitting between them!